Trump Suit Bridge Accessories supply 100% plastic symmetrical bidding cards. It includes 4 packs of refill cards for bidding boxes and standard bidding devices. The cards are of high quality and made of 100% plastic. The symmetrical bidding cards are suitable for both left handed and right handed bridge players.Most bridge clubs use bidding boxes filled with cards designating every possible call.The cards provide an instant review of the bidding and eliminate the possibility of mishearing an auction. 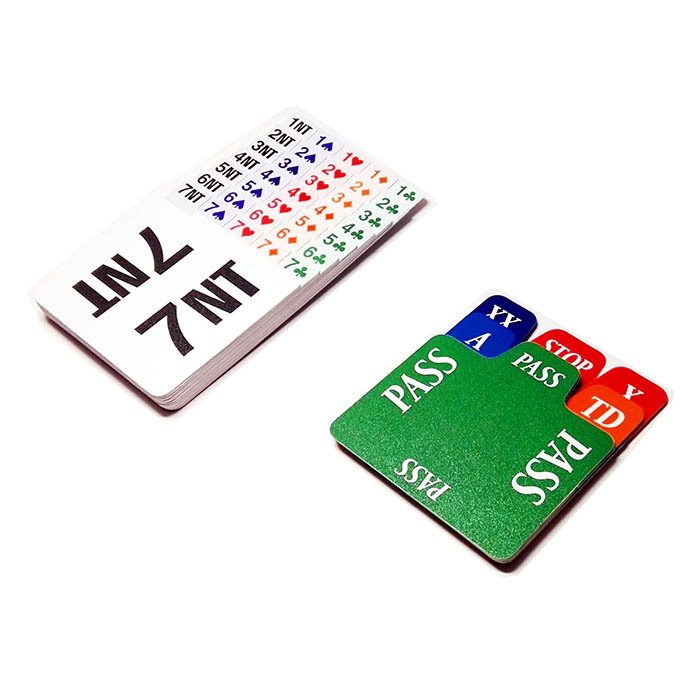 Now Plastic bidding cards are more and more popular due to its durability and comfort during bridge playing.It is also washable and water proof,it enables you to wash them when cards are splashed by coffee or tea or something else. Trump Suit Bridge Accessories supply 100% plastic symmetrical bidding cards. It includes 4 packs of refill cards for bidding boxes and standard bidding devices.The price incl postage of regular post service(30-60 days) to almost every country of the world.